MOSCOW, March 18. /TASS/. Russia recognizes the Republic of Macedonia under its new name of the Republic of North Macedonia, the Russian Foreign Ministry reported on Monday. 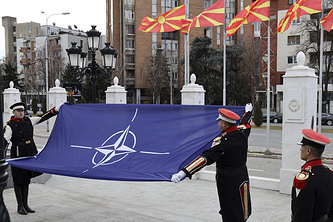 "On February 19, 2019, the Russian Embassy in Skopje received a note from the Republic of Macedonia’s Foreign Ministry with a notification about changing the country’s official name to the Republic of North Macedonia. Russia recognizes that country under its new name of the Republic of North Macedonia," the ministry said. The agreement on changing the country’s name to the Republic of North Macedonia (the Prespa agreement) was signed on the shores of Lake Prespa by the foreign ministers of Macedonia and Greece on June 17, 2018. On January 11, 2019, Macedonia’s parliament approved the relevant amendments to the country’s constitution. The Prespa agreement was ratified by the Greek parliament on January 25. The ratification of the document marked the end of the dispute between Macedonia and Greece over the name of the former Yugoslav republic, which had dragged on for over twenty years. Athens argued that its neighboring country’s name should be changed and opposed its accession to the European Union and NATO.